Honda Thailand has revealed a special edition for the Civic Hatchback at the 2018 Bangkok Motor Show. 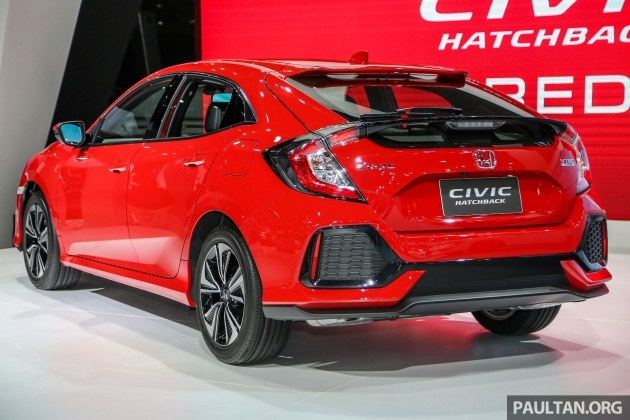 The Honda Civic Hatchback Red joins the “Red” edition of the Honda Civic FC sedan, which was introduced late last year. The Honda Civic Red, essentially a Rallye Red coloured high-spec variant of the Civic, is available for both the 1.8EL and Turbo RS variants of the Civic sedan – those two are the highest specs available for the 1.8 litre naturally aspirated engine and 1.5 litre turbocharged motor in Thailand. Highlighted equipment include Honda LaneWatch (camera on the left wing mirror), a seven-inch touchscreen head unit with Apple CarPlay and a digital LCD meter panel. The Civic Hatchback is sold here in a single 1.5 VTEC Turbo spec, so the Red is based on that. Like the sedan, the engine makes 173 PS and 220 Nm of torque from 1,700 to 5,500 rpm, mated to a CVT automatic with paddle shifters. Like the booted FC, the five-door hatch also wears 17-inch wheels, but in a different blade design. The lower front bumper design also differs – see the larger “air intakes” surrounding the fog lamps. Not quite a Civic Type R without the outrageous aero bits and stance, but for many, this will be as close as it gets. The Dark Ruby Red Pearl offered by Honda Malaysia for our Civic (as seen on the HR-V and City) is a much darker shade, almost maroon in comparison to this bright “Ferrari Red” hue. 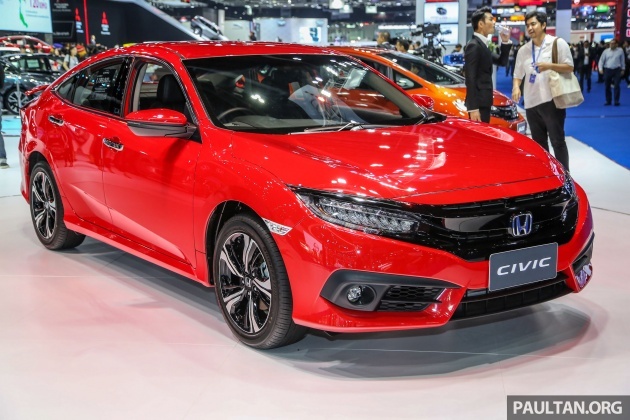 Do you think there would be demand for a Civic Red in Malaysia? Don’t ask for the Civic Hatchback though – they’ve established that there isn’t enough demand to make a business case for the five-door. Maimiti mesia auto hub asean…? Betul kah…??? Drb-honda, satu dunia ada Civic Rally Red color kecuali msia tarak..? Next gen vios oledi launched in Cambodia… Emission test facilities national standard test procedures pun tarak, apa tu EEV maimiti …? Jacked up Civic Hatchback sure sell like hotcakes. More than Subie XV & Suprima combined. The civic is an ugly ah beng car. why are the tailpipes still hidden? flaunt it! Lazy to the max. Looks 99% similar to sedan. Most probably 99% of the components are same too. Good for those with houses having limited parking and those also like to own a hatch back as second car. Honda Malaysia could produce them in batches of 100 every 2 month. No issue and actually with advantages as its mechanicals would be almost 100% same Civic sedan. Only mid to back part body is different. These can be imported without investing in the large body stamping machine?. Upon closer look, the car does look quite awkward especially with too many exaggerated design features. This rallye red is much nicer than the local maroon red. The 5door hatch back is a nicer car for a change and HM should bring in like the UK hatch model 1.5T with dual center exhaust pipe and even maybe a manual transmission as this is possibly the closest one can get to a FK8R look. And this may just spike interest and boost the already good Civic sales further. Just my 2cents thoughts.